Bordalo II is a street artist that takes rubbish and recycles it into art for the purpose of bringing attention to the issues we face with pollution and how it is impacting our environment. Bordalo II has a website where he talks about why he does what he does, "I was born in Lisbon, 1987. I belong to a generation that is extremely consumerist, materialist and greedy. With the production of things at its highest, the production of 'waste' and unused objects is also at its highest. 'Waste' is quoted because of its abstract definition: 'One man's trash is another man's treasure.' I create, recreate, assemble and develop ideas with end-of-life material and try to relate it to sustainability, ecological and social awareness." 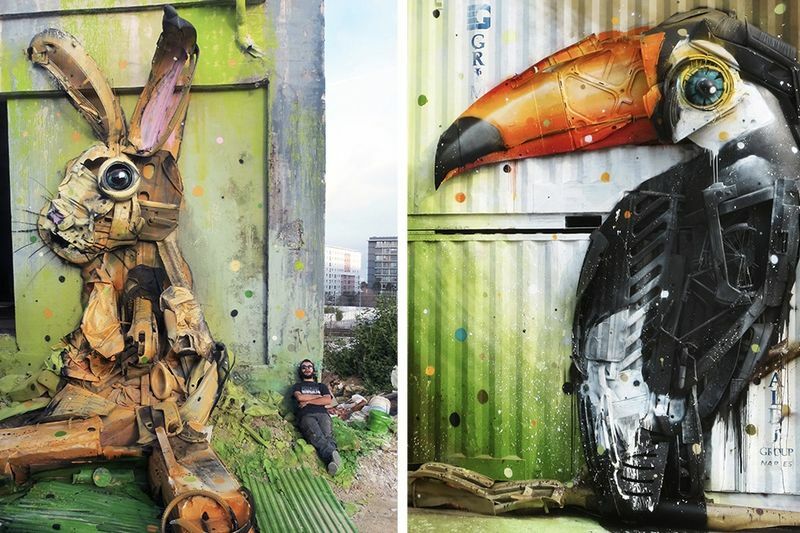 You can flip through our gallery of images of Bordalo's work where he mostly creates animals out of the rubbish us humans create. Video: First Peacocks In Airports Now Dinosaurs? The Zoo Does Some Winning Amazon Reviews! Video: Hilarious Art History Tweets That Totally Relate To Today!